Home » Posts Tagged "La Durée"
The line-ups for La Durée’s Macarons in New York are always long because they are delicious, the very best. 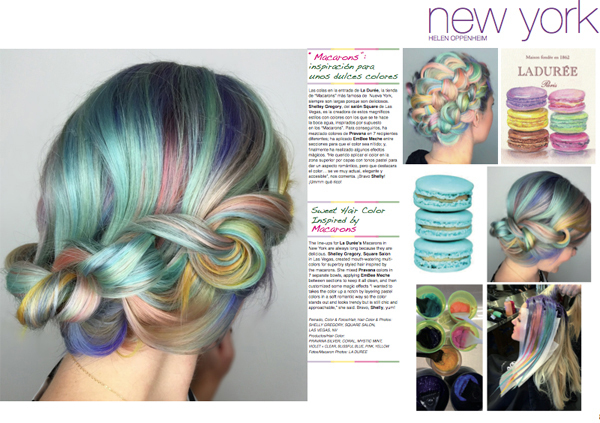 Shelley Gregory, Square Salon in Las Vegas, created mouth-watering multi-colors for superbly styled hair inspired by the macarons. She mixed Pravana colors in 7 separate bowls (Silver, Coral, Mystic Mint, Violet + Clear, Blissful Blue, pink, Yellow) and applied EmBee Meche between sections to keep it all clean, and then customized some magic effects “I wanted to take the color up a notch by layering pastel colors in a soft romantic way so the color stands out and looks trendy but is still chic and approachable,” she said. My article on these lovely looks appeared in my March 2016 column in Peluquerias Magazine, published in Barcelona Spain. Bravo, Shelley. Yum!